Hi everyone! I'm back on the Rhodes Bake N Serve Blog sharing another tasty recipe using Rhodes frozen bread dough. 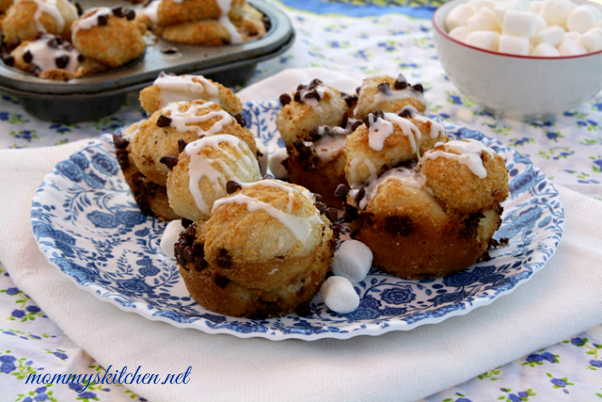 This month for my guest post I was asked to share an easy kid-friendly after school snack, so today's recipe is for these easy S'mores Monkey Bread Muffins! When it comes to mini versions of anything, I'm always sold!!! S'mores Monkey Bread Muffins are ooey-gooey individual sized monkey breads made with Rhodes Frozen Dinner Rolls, graham cracker crumbs, chocolate chips, and mini marshmallows! Since were on the topic of mini this recipe is also great to bake with your kids. I love to have my kids in the kitchen baking with me, and this recipe is one that they can pretty much handle all on their own. You might need to cut the rolls with scissors, but other than the kids can handle the rest. Let your kids roll the dough pieces into graham cracker crumbs, and layer on all the chocolate chips, and mini marshmallows. All you'll need to do is help with baking the muffins in the oven. 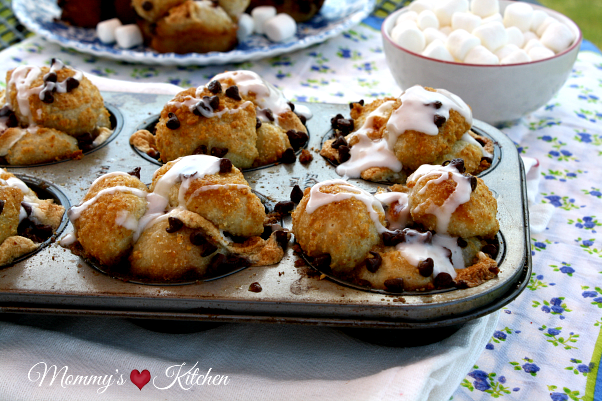 These S'more Monkey Bread Muffins are super easy and super delicious! 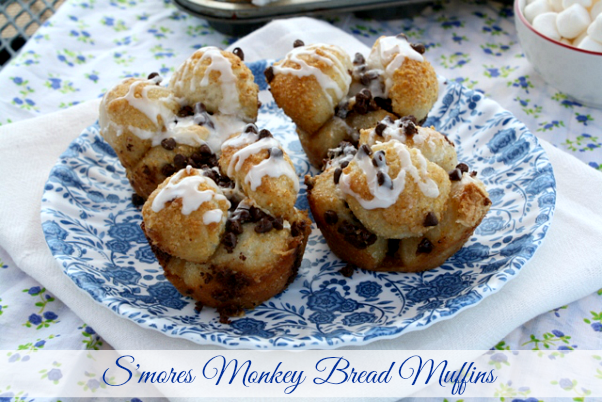 I hope you'll stop by the Rhodes Baking Blog where I'm guest posting today, and sharing the full recipe, as well as step by step photos on how to make these easy S'mores Monkey Bread Muffins. Using kitchen shears, cut each dinner roll into 4 pieces. Set aside Spray a 12 cup muffin pan with non stick baking spray. Set aside. In a small bowl melt the butter. Set aside. In separate small bowl add the sugar and graham cracker crumbs together. Add 5 roll pieces into the melted butter, and then roll them into the graham cracker crumbs Place 3 dough pieces into each muffin cup, and sprinkle some mini chocolate chips, and add 5 mini marshmallows over the dough pieces. Add the remaining 2 dough pieces on top of the chocolate chips and marshmallows. You can add a few more chocolate chips on top before baking if you like. Bake the muffins at 375 degrees for 10 – 14 minutes, or until the rolls are golden brown. Cool muffins in the baking pan 10 minutes before removing to a serving plate. Prepare the glaze and drizzle over each monkey bread muffin before serving. Click here to visit the Rhodes Baking Blog for more tasty recipes. This is a sponsored post on behalf of Rhodes Bread. I'm a contributing guest blogger on Rhodes Bake N Serv Blog, where I share recipes and ideas using Rhodes Products. All opinions stated above are 100% my own. They look fantastic. Can't wait to make them!